Last week I was asking for your opinions on the state of cask ale in Portland. 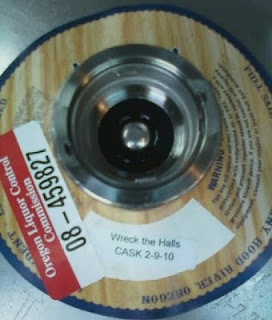 Here's some evidence in support of Ted Sobel's gripe about "cask-conditioned" beer: a pony keg of cask Wreck the Halls that Dave picked up for the Main Street solstice gathering. Definitely just a regular-'ol keg, of a very burly Full Sail beer that wasn't brewed with cask ale as the first thought. Over the weekend I wasn't tsk-tsking it, I was glug-glugging it, because it was mighty tasty, even if it wasn't culturally authentic. 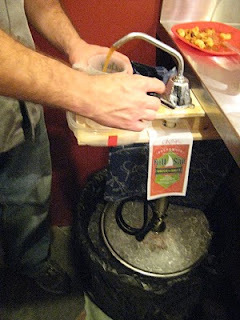 The biggest problem Dave had was, how do you get the beer out of the keg? It didn't have a blowhole like a firkin does, so he couldn't just somehow tap it and drain it. On the other hand, forcing it out with a keg tap or CO2 seemed risky. Dave is always up for some kind of project, so he made his own cask engine, using some kind of RV water-pump gadget and the fitting from a regular keg pump. By unscrewing the central cylinder of the keg pump, the keg was able to breathe in air to make up for the lost volume of ale. It wasn't as eye-catching as English pub-style cask handles, but it got the job done for the party. And, yes, that's too much ice cooling it off -- we had to let the beer warm up after dispensing it. On the earlier post about cask ales, I was hoping people would name more names of places with good or bad cask ale. There wasn't much response, but here's what I got, plus I'll add a bit of my own opinion. Lucky Lab - pains me to say it, but that two-week old Black Lab Stout has its tongue hanging out. A make-shift Beer Engine does not make a beer a cask ale. ;-) Push it with CO2 and enjoy. Bill: I wouldn't use the word "risky" regarding the use of C02...I just figured it would defeat the purpose of having a supposedly cask-conditioned beer. I did over-cool the beer; ideally I would have run the line through a chiller coil for more control of the temperature. Anon: I was taking Full Sail's word on the authenticity of their cask conditioning. I wouldn't have gone to the admittedly minimal effort of rigging a hand pump for a regular keg; I'm far too lazy for that. As with most of my projects, the internet gets most of the credit. If anyone is interested I will post the most pertinent links.